Inspired by her works that patch together fabrics as a metaphor for self-healing, Kimsooja then made herself a needle with the mandate of sewing society together. 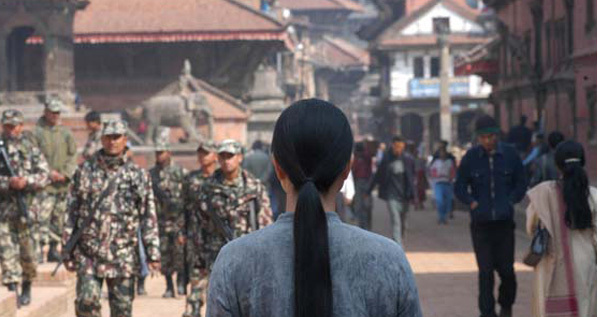 A Needle Woman (2005) is composed of six videos for each of which Kimsooja went to a city agitated by political, religious, or armed conflict, placed her body-needle perfectly still in the middle of the crowd and in the centre of the screen, then “sewed” the passersby to each other. This work of calming is sustained by the silent from the absence of a soundtrack and Kimsooja’s meditative pose, which, assimilated with the viewer’s position, links the viewer to the distant scene and proposes non-aggression, meditation, and compassion as true social actions. Born in 1957 in Taegu, Korea, Kimsooja lives and works in New York. In her multidisciplinary practice (video, installation, performance, audio works, textile works), Kimsooja plays a “needle-woman” who aims to stitch dualities together. Her works have been presented throughout the world over the last 30 years, including at P.S.1 Contemporary Art Center in New York (2001), the National Museum of Contemporary Art in Athens (2005), the Venice Biennale (2005), the Museo Reina Sofía in Madrid (2006), the Cairo Biennale (2009), the Baltic Centre in England (2010), and the Musée d’art de Joliette in Quebec (2010).